consider the slab shown in Fig. 23-2 Suppose that ∆x = 24.9 cm, A = 1.80 m2, and the material is copper. 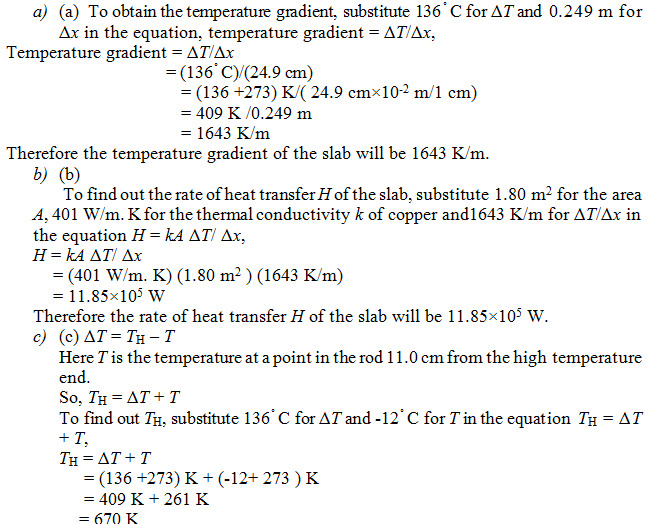 If T = - 12.0ºC, ∆T =136 Cº, and a steady state is reached, find (a) the temperature at a point in the rod 11.0 cm from the high-temperature and. Rounding off to two significant figures, the temperature at a point in the rod 11.0 cm from the high temperature end will be 490 K.